Hey everyone, just wanted to drop in a say hello to all of my (now) fellow VTR owners. 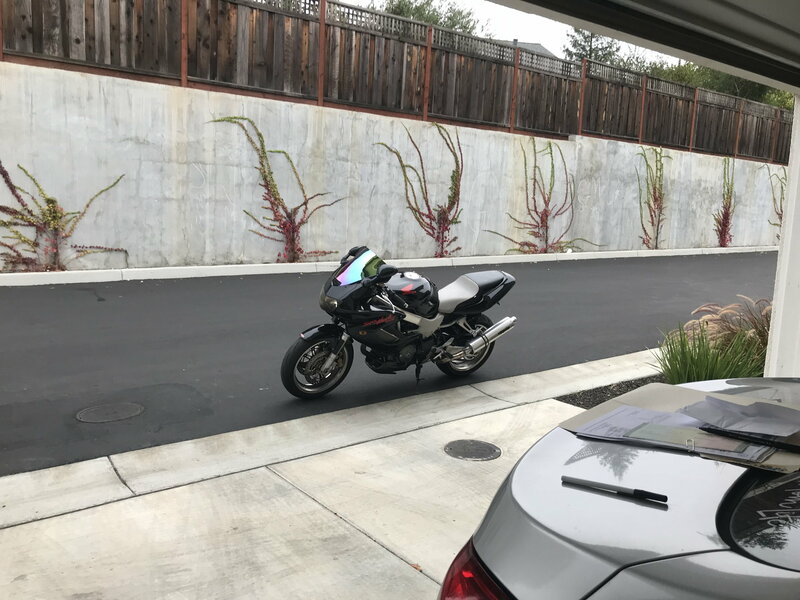 I’ve had several bikes throughout my 29 years of life (SV650, Buell X1, Buell XB9s, Sportster) and have always loved the V-Twin feel and sound! About three years ago when my wife and I found out we had a little guy on the way, I was forced to part with my Sportster. My 30th is in a couple of months and I have been eyeballing some used bikes. 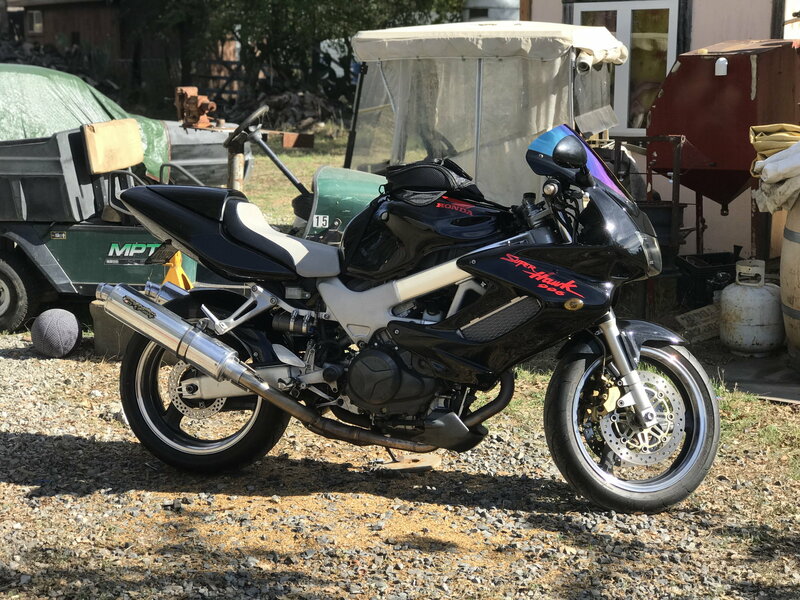 I came across a 99 VTR1000 on Craigslist a few weeks back and I thought it was a hell of a deal. This guy had just recently retired and was selling all of his bikes (except the new one he bought as his retirement gift). He had a stable of about 6 bikes he rotated for his daily commute throughout the years, the Superhawk being one of them, and drove about 100 miles daily. I saw the superchicken and for $1000, I said why the hell not..
so so here’s the crazy part: since all of his bikes were rotated throughout the years, the superhawk has 137k on it and has never given the guy I purchased it from (who was the original owner) any problems except for routine maintenance. I have two maintenance folders combined of about 12” thick, he also gave me a service manual, two seats (including a Corbin) a rear seat cowl, rear tire hugger, two windscreens, a bike cover, some extra sprockets and special tools for the VTR. So 137k is high right? Well what inspired my confidence to jump on the bike was that all of his bikes for sale had over 120k miles on them. The dude was super meticulous on all of his bikes and they were all set up for his commuting and to be comfortable. She runs and rides great, probably the best $1k I’ve ever spent! Looking forward to all of the knowledge and resources available here on the site. Excited to join the community! Welcome! The iridium screen looks cool. Thanks Wolverine! Looking forward to getting a few miles under my belt on the bike and maybe start tinkering to tune it to better suit me (small guy, 5’4” 140lbs). I’ll be primarily using it for commuting, just like the PO - Original Owner. I’ve attached a photo from his original craigslist post showing some of the mods/included items. Do you guys think $1k was an OK deal? That is a steal at that price. Welcome on board. So 137k miles? You can search on here for things to check like valves, CCTs (cam chain tensioners) and regulator rectifiers which all should be looked at to protect your investment. If you like V twins this is one of the best. hopefully since I have the service manual (and with resources available here too), I can do some of th wrenching myself. I’ll certainly look through the service records to see the last time some of those items were done and to see if they’re currently due. I’m registering the bike with DMV tomorrow finally and will begin to ride it more frequently here shortly.